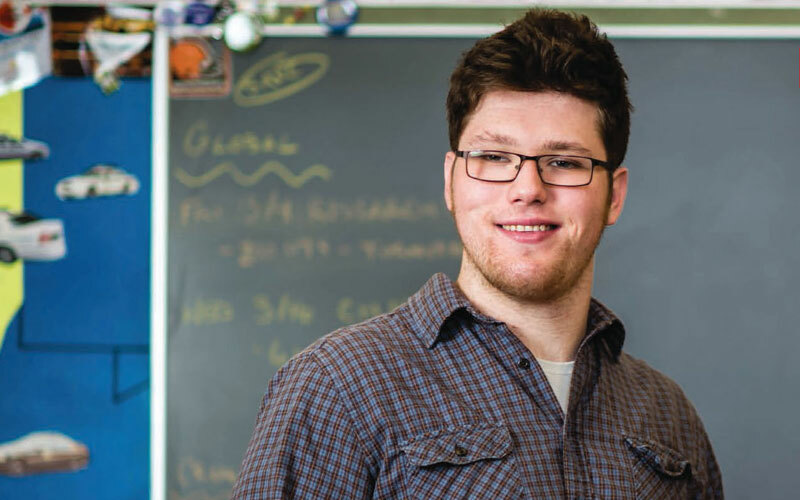 Daniel Kilroy, a senior at Shaker Heights High School, has attended the Shaker schools since Pre-K, where he attended Shaker’s Early Intervention Program. Here, he explains how a visual impairment known as Duane’s Syndrome affects his educational needs. I have a paralyzed cranial nerve that prevents me from correctly moving my eyes. They stay fixed in front, so when I’m trying to read or watch something that moves, I can’t lock onto it and track it. I can’t read down the page without stress, so my eyes get fatigued. It doesn’t prevent me from doing anything, it just makes it more difficult. I played football in fifth grade as a lineman, but I couldn’t keep track of the ball or who was around me, so I wasn’t as effective as I could be. I switched to wrestling, which I have done for four years, because it’s a more one-on-one sport, and I’ve also done track and field. For all of my school career, I’ve had guidance and someone to talk to if I need help with my visual impairment. I have a Teacher for the Visually Impaired (TVI) who comes to school and helps me try different things to help me out. I was only ever treated differently at school when I received the necessary accommodations, like extra time for tests, larger print, and a scribe who writes down my answers onto a Scantron sheet. Because of these accommodations, sometimes I felt like I was taking the easy way out, or cheating in some way. This is all I’ve ever known, so it’s not like I have something to compare it to. This is normal for me. My TVI and intervention specialists at Shaker helped me to understand that I really don’t have the same visual prowess as other students, so I do deserve the help I am getting, and that I should speak up if I need something. I recently started sending out emails to my teachers to let them know about my needs, and that I might need extra time on assignments or to step out of the classroom to rest my eyes. I also go to the Intervention Lab every day for 10th period so I can catch up on assignments and get organized. At Shaker, I learned perseverance, advocating for myself, resourcefulness, and overall study habits. Science and English are my best subjects. History is also one of my favorite subjects, but it was really hard for me because it’s such a reading-heavy class, and I still struggle with note-taking. Next year I plan to study geology in college. I’m not really worried about academics, more just the personal responsibility part. I know there will be similar disability services in place at college. I just earned my Eagle Scout award by replacing and extending a guideline along the trail to a new cabin at the Cleveland Sight Center’s Camp Highbrook. I have been a client at the Sight Center for most of my life. If I find other opportunities to work with the visually impaired, I think I would probably like to do that.